Bloomability: You aren't defined by your test grade..
My dad had a heart to heart with me at the beginning of semester reminding me "It's just a TEST." Of course that irritated me because that's obvious, but not psyching myself out is WAY easier said than done. After not excelling in my first round of tests like I wanted, which is usually the case, I made the decision that tests would not control me, define me, or affect me in any way shape or form! "I am bigger than this test and it wont defeat me. 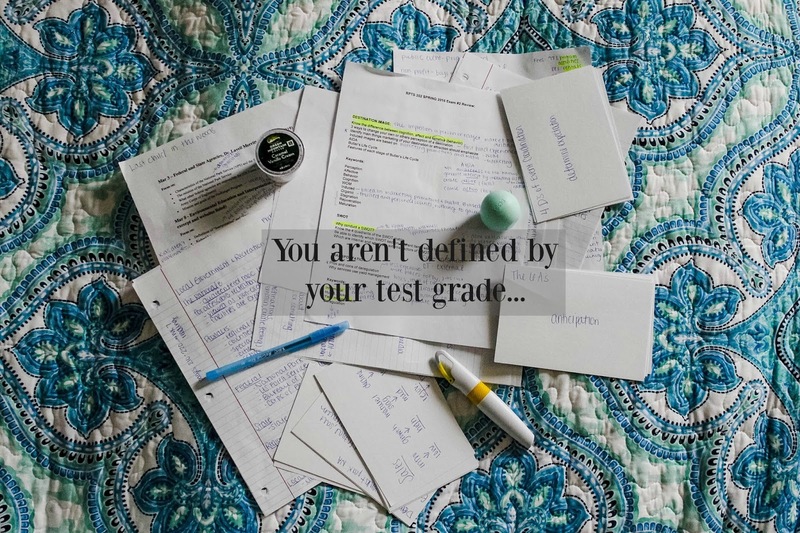 This test grade will not define me." That being said, coming off Spring Break I was heading in to two weeks of papers, projects and 3 tests. Inside I was freaking out as you can imagine. I started prepping when I got back and reminding myself daily that I was bigger than these tests. Certain days were better than others but when this past Tuesday arrived I was ready to conquer this small giant (or what felt like a big one in my head). I came out of the test confident and relieved. 1 down 2 to go I told myself. Wednesday I took my last two (till finals!).. my morning test didn't control me and neither did my afternoon test. I made a huge breakthrough. The tests did not define who I was. With that, I am here to give you the steps/tips I took to not being consumed by my exam. - Before I received my test review from my professors, I went through all the power points and wrote out my own review. (Yes this takes time but then you start to really refresh your memory on all the information.) Make sure you actually write it, don't type it. It's proven you retain more when you hand write something. - Once you receive your review go through it and physically fill the whole thing out. - After you read through your review multiple times a day, start to tell yourself in your own words what you've wrote and learned. When you are able to tell yourself, that's when you really know the information. - Now that you have gone through the material in the best way possible, I'm sure you have some questions for your professor, highlight the things that you need to go over so you are readily prepared to ask any and all questions you may have. - For vocab words, make notecards and quiz yourself when you're walking, on the couch, getting ready or whenever you can. - The day of the test I recommend going through the review covering up the answers and asking your self the bullet points or questions on the review and answer them in your own words. This way you'll be the most confident. These were the physical steps I took towards success for my tests. Emotionally, remind yourself daily, "this test doesn't define my success." Eat, Study, TAKE A BREAK, Sleep, Repeat. You can do it! I believe in YOU!! Love you, Abi! So proud of you!